A great facet about craft beer is that brews can always be talked about. Seasons come and go as they usually do, and with that natural ebb and flow of nature comes seasonal brews. Even when the season changes craft beer drinkers still reminisce on those delicious sips. When it comes to beer I get a bit nostalgic for the great pints I had. If it were socially acceptable I would carry around wallet-sized photos of all my favorite beers I’ve had around in my purse to show off like some people do with photos of their children. But I guess that is what Instagram is for. Anyways, even if a beer has come and gone from the shelves or taps they still have a place in that brewery’s history. 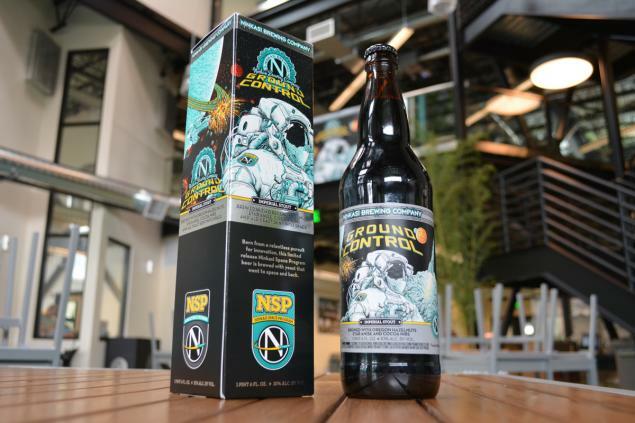 Ninkasi Brewing in Eugene, Oregon made beer history this year with their Ground Control Imperial Stout. The beer came out in April and is still a monumental step in experimental brewing. It’s one step for stout, a giant leap for beer-kind. And any other space launch sayings there are. This stout was made from brewer’s yeast that was sent up into outer space and it is glorious. Just when you thought craft beer could not get any more awesome. Ninkasi sent a rocket into space containing six vials of active brewer’s yeast with dry ice to see if a life-sustaining source could survive space travel and then be viable enough to brew beer with it. In case you didn’t know, yeast is very fickle and will die if not in the right condition. Good news, it was. Two missions were conducted all for the sake of beer kind. The first mission was a failure so they tried for round two and thank the goddess Ninkasi the yeast survived. According to Ninkasi’s facts, the rocket achieved an altitude of 408,035 feet- 77.3 miles above the earth- and the yeast was weightless for four minutes in space. Then the rocket fell back down to earth and was retrieved by a U.S. Army helicopter to ensure its safety back to the labs for brewing. This project was a year in the making and now humanity can enjoy beer from space. The beer made from the yeast is appropriately named Ground Control and is an Imperial Stout and it is only available in limited locations in 22 ounce bottles and on draft at Ninkasi Brewing in Eugene. It only made 55 barrels so when the tap runs dry, that is the last of it. Believe me when I say this beer is limited because it took me a few weeks to find this coveted brew. Because of course when I read that there is going to be beer made from ingredients that traveled to the final frontier I had to try it and so I wrote down the launch date into stores and waited until that time. I had to make several phone calls all over Oregon until I found this precious dark beer that has been further into the atmosphere than I ever will be. I found the beer, not just on the shelf of Corvallis Brewing Supply, but in a snazzy box with the 22 bottle inside. With the price I paid for this beer it better have come in a box. Ground Control is brewed with the even more appropriately named Apollo, Comet and Bravo hops, Oregon hazelnuts, star anise, coco nibs and Ale yeast that graced the stars. All of the ingredients created a stellar tasting beer that is definitely unique. Anise is used in cooking as a bittering agent and to add a licorice flavor and the hop varieties used in the stout are also bitter, mostly used in making IPAs, but this beer was not bitter in its entirety which is very interesting. Instead the stout tasted more of the hazelnuts and coco nibs and had a full-body feel with a slight bitter aftertaste. A chocolate, honey, and crystal malts were also used in brewing which gave the beer a greater chocolate and nutty flavor that enhanced the hazelnuts and cocoa. This chocolatey stout was a smooth beer to drink which made the bottle go by way too quickly. I always enjoy tasting new beers, it is one of my favorite hobbies, and Ground Control was an amazing experience I recommend to any beer lover out in the universe. Of course the space yeast is what makes this beer entirely unique and a conversation starter, but it was made by a great brewery that knows their stuff and can make a gorgeous brew. If you want a distinctive beer experience, find Ground Control and prepare for take-off. This beer really IS out of this world! Great article about a great brewery, I do so enjoy reading your updated posts. Thank you!